In my past experiences, the bad really overshadowed any good. Mostly because of small portions or the disconnect on what was offered during RW vs their regular menu. American Cut however had great option. Start off, that killer biscuit with veggie cream cheese/butter. For appetizers you can choose between champagne, black truffle oysters or bacon in MF steak sauce. There’s a salad, but why would you choose that over oysters and bacon!? Entree wise, my 9oz hanger steak was perfectly rare. Covered in pastrami spices, smoke. Pops of black pepper and mustard brought a punch to all that buttery goodness. It was so good, I can’t wait to go back for their regular menu. They also had 2 sides to choose from, a sunchoke creamy spinach or “Robuchon” style, velvety potato puree. Both fantastic. Our dessert of choice was Cracker Jack Sundae, with popcorn ice cream. Aside from it all being really freakin’ delish, most of these dishes can be found on their regular menu (thank you, we appreciate that!). The sundae was a smaller portion, but honestly after all that food, it was the right size. The 5 of us were stuffed in a good way *rubbing tummy*. 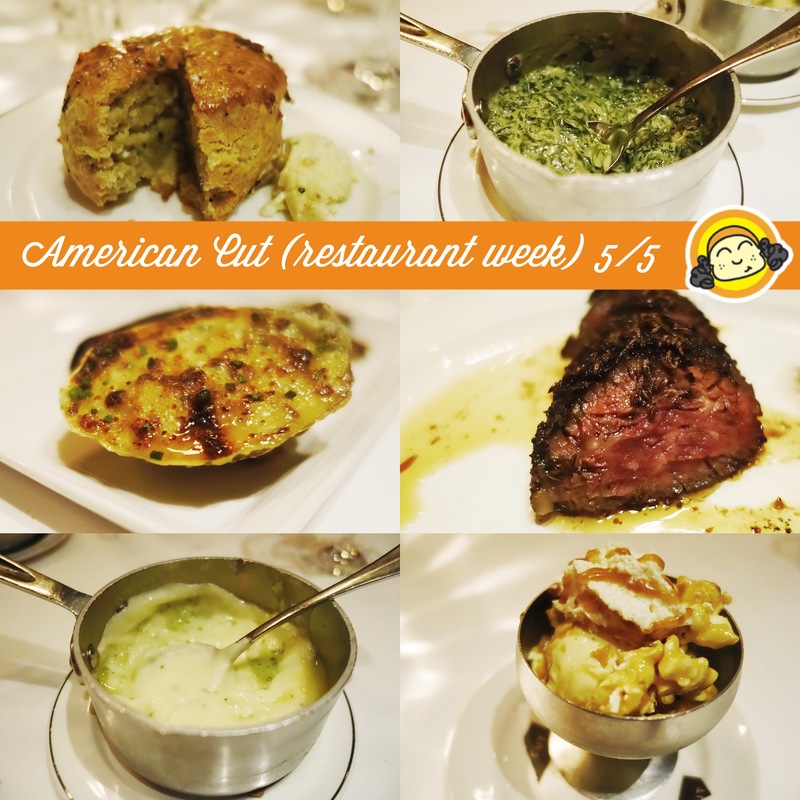 If you have one place to go for Restaurant Week NY 2015, I’d highly recommend American Cut.